About 100 species, widely distributed in temperate and tropical regions; only the following known to occur in North America. 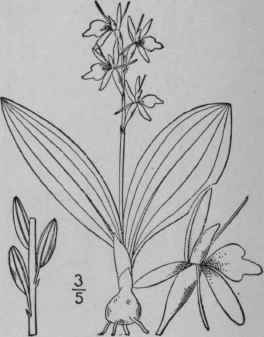 Type species: Liparis Loesclii ( Willd.) L. C. Rich. 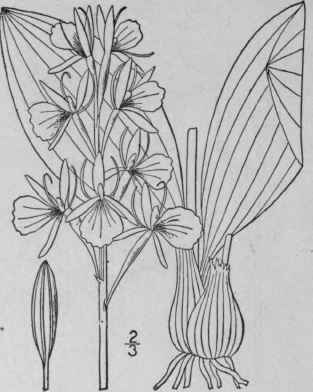 The name Leptorchis, used for this genus in our first edition, appears, after an examination of its first publication, to be intended only as a French designation, not Latin. Raceme many-flowered: lip as long as the petals. Raceme few-flowered; lip shorter than the petals. Ophrys liliifolia L. Sp. PI. 946. 1753. Liparis liliifolia L. C. Rich. ; Lindl. Bot. Reg. pl. 882. 1825. Leptorchis liliifolia Kuntze, Rev. Gen. PL 671. Scape 4'-10' high, 5-10-striate. Leaves ovate or oval, 2'-,5' long, 1-2 1/2' wide, obtuse, keeled below, the sheaths large and loose. Raceme sometimes 6' long; flowers numerous, showy; sepals and petals somewhat reflexed; petals very narrow or thread-like; lip erect, large, 5"-6" long, about as long as the petals, wedge-obovate; column 1 1/2' long, incurved, dilated at the summit; pedicels slender, ascending or spreading, 4"-8" long; capsule somewhat club-shaped, abous 6" long, the pedicels thickened in fruit. In moist woods and thickets, Maine to Minnesota, Georgia and Missouri. Ascends to 3000 ft. in Virginia. May-July. Ophrys Loeselii L. Sp. PI. 947. 1753. Liparis Loeselii L. C. Rich. Mem. Mus. Paris 4: 60. 1817. Leptorchis Loeselii MacM. Met. Minn. 173. 1892. Scape 2r-8' high, strongly 5-7-ribbed. Leaves elliptic or elliptic-lanceolate, 2'-6' long, 1/2-2' wide, obtuse; raceme few-flowered; flowers greenish, smaller than those of the preceding species, 2"-3" long; sepals narrowly lanceolate, spreading; petals linear, somewhat reflexed; lip obovate, pointed, rather shorter than the petals and sepals, its tip incurved; column half as long as the lip or less; capsule about 5" long, wing-angled, on a thickened pedicel. In wet thickets and on springy banks. Nova Scotia to Saskatchewan, south to Alabama and Missouri. Also in Europe. May-July.